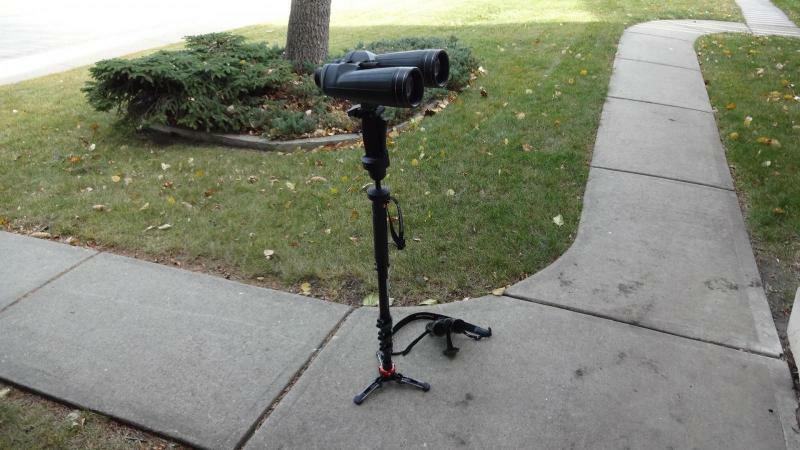 Wanted your opinion if this monopod and head setup would work well with my current Celestron 15x70 binoculars or anything in the 80mm range that I'm on the market to buy. I do enjoy the flexibility of hand-holding my Celestron Cavalry binoculars but there are times that I want more steadiness. You should be fine using your Celestron 15x70 binoculars. The 322RC2 is rated for 11 pounds of weight. You will need to experiment with the friction drag control. The 679B can support 22 pounds of weight. Just make sure that you snug the screws & nuts for the leg releases. You don't want it to collapse on you without warning. a small allen wrench for adjusting tension on the ball. the 322RC2 ball head. Worth a try. Edited by hallelujah, 06 December 2018 - 05:33 PM. Thanks for your input Stan. The youtube videos are very informative. I have the 322RC2 on a Manfrotto XPROA4 monopod . It gets used frequently with my 5.5 pound AP 15x70's and occasional use with my 10x35 E2's with no problems at all . Very happy with the setup. With Albie's help I have the exact set up and it works very well. I have two different Manfrotto monopod setups. With the same altitude head. I use the first for birding and for heavy pack backpacking with mid sized binoculars. 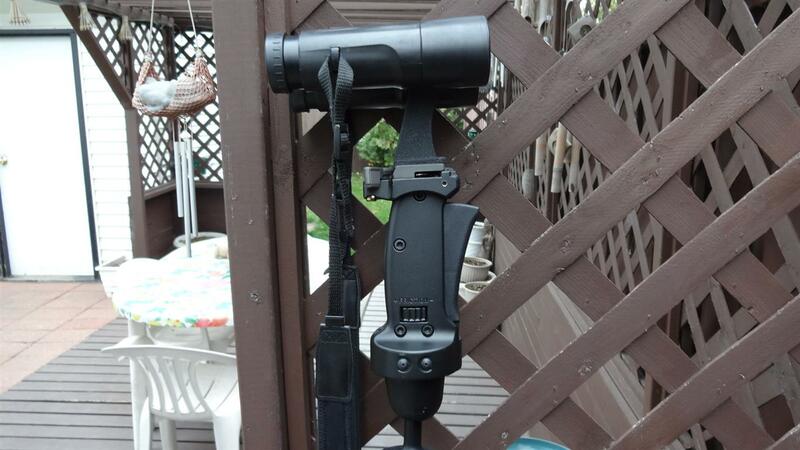 I use the quick deploy pistol grip monopod for light and fast night time treks into local open space preserved (after hours) to do Ninja astronomy. I like them both. 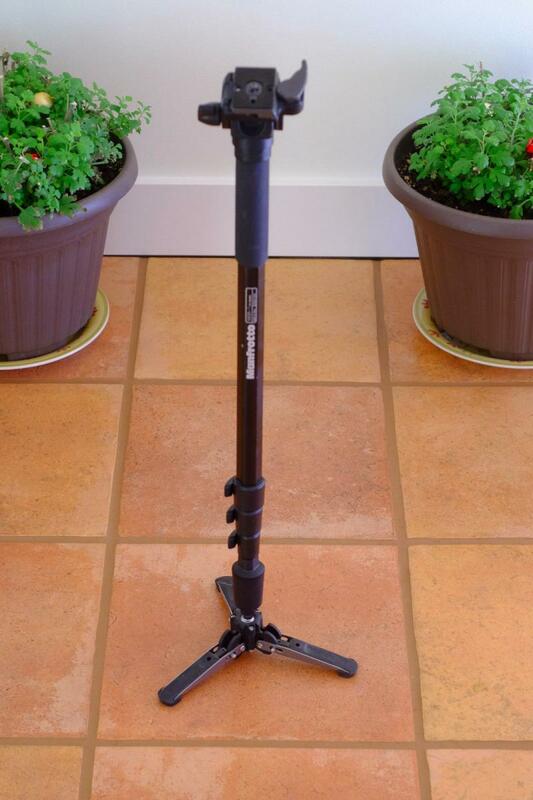 The three footed monopod is more stable, but the pistol grip unit us faster, lighter and more compact. Mine is Manfrotto 560B monopod with 234QR head for my Nikon 12x50SE similar to this one. Very happy with it. I'm having some second thoughts if I should spend the $150 (cost of monopod plus head) and instead invest it in a better pair of binoculars. The 15 x 70 Cavalry are very lightweight for its size but the image does suffer from collimation and sharpness issues. I could probably sell these for $50 and have a budget of $200-$250 for another pair. Upgrade to a better binocular. You may do as Stan suggested. Instead of buying a last generation monopod with all the whistles, you can upgrade for a better binocular and still get some money for a used simple combo of monopod and tilt head for the extra support you need. I got a as new boxed Manfrotto 681B monopod for 40€ and I later bought a new Manfrotto 234RC2 tilt head for forty something (the same tilt head shown in different posts above). This is my most used mount and I am very happy with the support it provides. It is stable and keeps the weight of the binoculars out of my arms and shoulders.  It is easy to pan horizontally and the vertical tilt is easily achieved and locked. Height is managed by a simple 45º turn lever. I can use it while I am standing or seated. When seated I can lock the monopod between my legs. Monopods are the mounts that give me the widest possible positions, without having to resort to some heavier and complicated mount, like a tripod or P-mount. Even with a simple monopod I can see a lot of improvement when viewing with my 10x50s. Also, a tilt head is way cheaper than a video head and it weighs much less. My monopod and tilt head combo is around 2lb only. I am shure you can get a similar combo close to new for even less (of what I have paid) in the US. I had decided to skip on the monopod combo and instead start looking around for a better binocular in the $300 range.